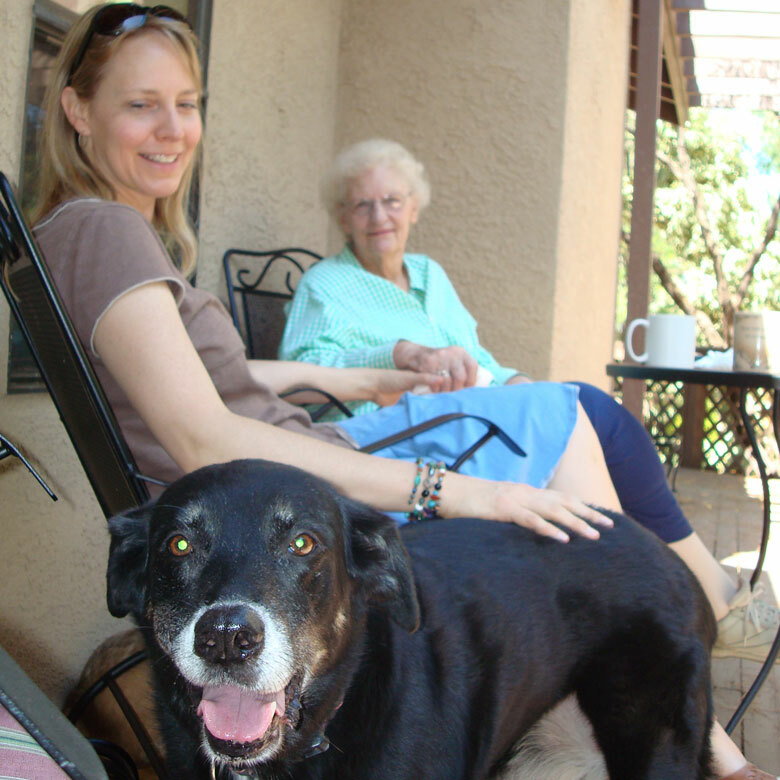 Sadie, me and my mother in Arizona after a breakfast of scrambled eggs. This is easy—take one of my courses in telepathic animal communication, or read one of my books on Animal Telepathy. How to successfully communicate with your animal. In the meantime, here are some pointers on how to ensure that when you are talking to your animals, they will understand. Another way of thinking of this is to be grounded and communicate coherently from the whole of your being, rather from disconnected (and sometimes conflicting) parts of yourself. This is what I teach in my courses. It can end up being a fascinating and enriching lifelong journey. What NOT to do …. Here is a story that shows what happens when you DO NOT communicate with your animals using all three ways. Shortly after I moved to Arizona, my mother came to visit. This was a few years ago and my dogs Rufus and Sadie were still alive. Rufus and Sadie LOVED my mother. She would keep them at her house when my husband and I would travel, and feed them scrambled eggs and bacon off a fork every morning for breakfast. Seriously. If I had been on top of my communication game, in addition to verbalizing this message, I would have also sent an image of my mother here in sunny Arizona, as well as the feeling of her kind and mothering presence in our living room, with scrambled eggs and bacon and her laughter and more. But I only sent the thought. Rufus and Sadie looked at me and wagged. Meanwhile, Rufus followed behind her, oblivious to what was really happening. So, what happened? Why did Sadie understand me and Rufus didn’t receive the communication? Just like with humans, animals have certain parts of their being more telepathically open than others. Rufus was a very feelings-centered dog. Before we got Rufus, Sadie was kind of a neurotic mess. She had motion sickness, vomiting every time she went for a ride in the car; and she had terrible separation anxiety, chewing up all kinds of clothes and furniture in our house when we would leave. When Rufus came on the scene, all of Sadie’s nervous behavior vanished. 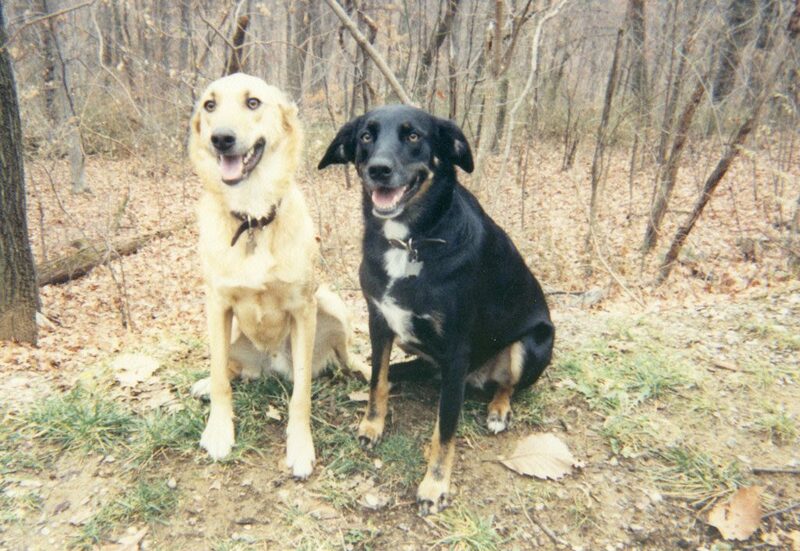 Resting on the beautiful, calm wisdom in Rufus’s heart, Sadie felt fine and never had these problems again. Rufus had an intelligence that was very special in his heart, a deep wisdom and presentness. Accordingly Rufus was very awake in this part of his being—telepathically sending and receiving information on the heart level all the time. So, if I had sent the images and feelings of my mother’s visit, and been more present in my own heart while communicating, Rufus would have understood, no problem. But, like most humans, I was more in my head that day, and I only sent the thought about my mother arrival, so he missed it. Sadie, on the other hand, was a very intellect-centered dog. She had so many clever games she would play. For instance she would fake out Rufus when he had her favorite chew toy, pretending there was a noise at the door, so he would get up and go bark with her, then she would rush in for the chew toy steal. And this is just one example. On the level of thoughts and planning, she was very intelligent. So, because I was more connected to my intellect when I communicated this message, Sadie understood perfectly clearly that my mom was coming to Arizona the next week. It is as if we all, humans and animals alike, have parts of our being that function as an operational center, and this part of us needs to be “online” in order for all levels of perception, communication, and learning to happen. Come into this amazing world with me. All this is so fascinating, no? I love all this nuanced understanding of communication. Each of us is unique in the way we hold our energy, how we position our consciousness. And this has powerful consequences for how we connect with others and the world around us. These are among the basic principles we explore and master in the Basic 1 and 2 courses. And there is so much more. In the Practitioner Program, we go into depth learning all the ways to deepen telepathic communication with animals so that we translate as fully as deeply as completely as we can. In the Practitioner Program, you learn how to communicate from the fullness of your being, to translate so that the most can happen for people and their animals. If you would love to learn more—reawaken and master basic telepathic communication in the Beginner Program, or refine your telepathic ability such that you can practice professionally with the Practitioner Program—don’t hesitate to reach out today. My next intake for the Practitioner Program is fall of 2018, and there is still space in my Basic 1 courses later this year. I would love to bring you into this amazing world. It will change your life in ways you can’t even imagine.